In July 1940, consular officials from three countries conspired to open an escape route for Jews, including my family, into Portugal. Why did they do it? In the aftermath of the German invasion of the Low Countries and France in May 1940, a wave of refugees descended on the southwestern region of France. Homeless hordes from Holland, Belgium and the north of France joined uprooted residents in the newly created Vichy puppet state in the south. For the refugees, and especially the Jews among them, getting out of France before the Nazis exercised full control could be a matter of life and death. The German Jewish widow Elly Ringel and her daughter Helga had been living in Nice since fleeing Berlin in 1938. Now they would have to flee again. 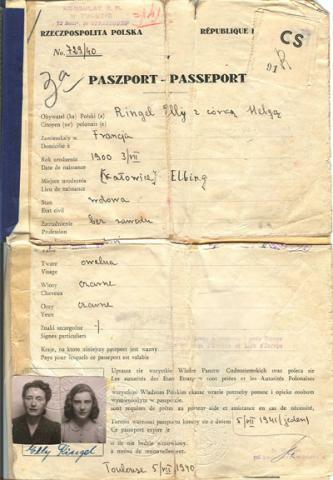 Elly was officially stateless but she carried with her a document proving her late husband's origins in a city, Rzeszow, in Poland. Before leaving Nice, Elly had Hermann Ringel's Polish domicile document translated into French. Though born in Germany, Elly's husband Herman Ringel had his family origins in Rzeszow in Poland. This 1906 domicile document attests to his Polish citizenship rights. Along with Elly's sister and her sister's husband, the Ringel party went first to Lyon, gateway to the Swiss frontier, but reversed course after recognizing a Gestapo agent there. In Marseille, they found the Polish consulate closed until further notice. After several days, they heard rumors of people obtaining visas in Bordeaux, on France’s Atlantic coast. Needing mobility, they stored their luggage at a station near Marseille. Later they would have the bags forwarded. 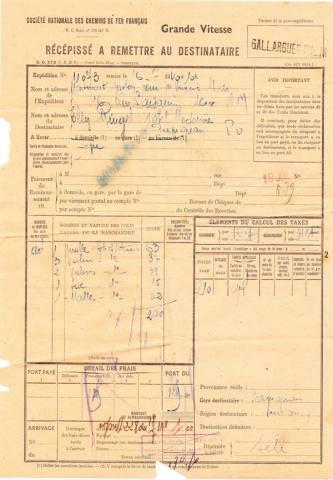 Receipt for eight pieces of luggage stored at the rail station at Gallargues-le-Montueux. Two weeks later they will retrieve the bags in Perpignan. For desperate refugees, one of the few ways out of Europe was first to reach to the neutral city of Lisbon, in Portugal on the other side of hostile Spain. In Bordeaux, the Portuguese Consul General Aristides de Sousa Mendes conducted a remarkable campaign of compassion by issuing more than 10,000 Portuguese visas to trapped Jewish refugees. The Ringel party arrived in the Bordeaux region on June 22, after Sousa Mendes had departed the city for Hendaye on the Spanish border. Aristides de Sousa Mendes is recognized as a Righteous Among the Nations for his life-saving acts. His career and personal life were ruined in retribution by President Salazar. Sousa Mendes was officially recalled by the Portuguese President Antonio Salazar days later in Hendaye. The Ringels arrived too late to benefit from his historically selfless actions. A week later, in early July, the Ringel party was in Toulouse among the throngs of refugees crowding city squares and clamoring at consulate gates. Portugal's consulate was particularly besieged, where Vice Consul Emile Gissot (a Frenchman) was under orders to issue transit visas only to those holding a visa and ticket to a final destination. 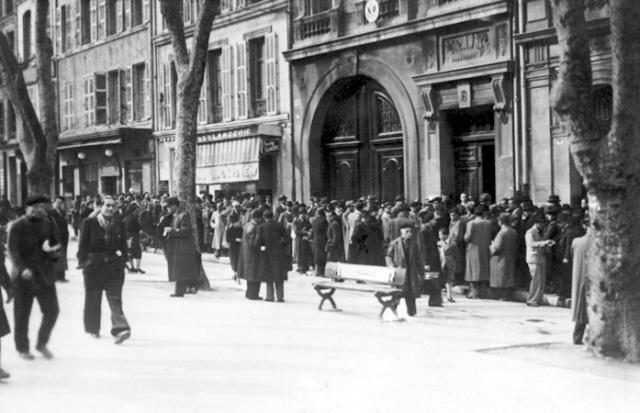 Consulates were mobbed across the south of France in June and July 1940. The above scene is outside the United States Consulate in Marseille. Things were no less hectic at the consulate of the Republic of Polish government-in-exile, where the appointed consul had himself taken flight. On July 5, Elly Ringel presented her husband's Polish citizenship documentation to acting consul Stanisław Wozniak. On the basis on the domicile document, Wozniak issued a Polish passport to the widow Ringel and her daughter Helga. But it was just the first of a series of documents they would need to acquire. Passport issued to Elly and Helga Ruby on July 5, 1940 at the consulate of the Republic of Poland in Toulouse, France. Perhaps it was Wozniak who advised Elly to go next to another consulate on the Avenue Strasbourg to request a visa for a certain Caribbean island. Or maybe it was a rumor she picked up on the street. But days later, on July 11, she obtained from the consulate of the Netherlands' government-in-exile a visa to travel to the Caribbean island of Curaçao—and presumably not for a holiday vacation. 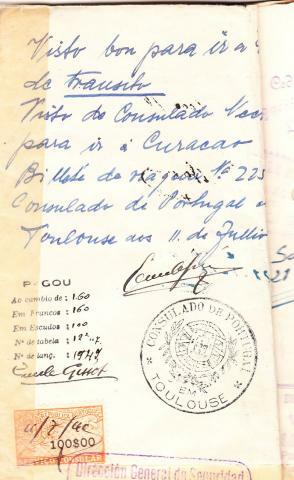 With the Curaçao stamp, she was then able to go to Portugal's consulate and secure from Emile Gissot the really critical credential, a transit visa to Lisbon, the last open port in mainland Europe. Elly Ringel's Curaçao visa, issued July 11, 1940 by G.P. Pichal, the career foreign service officer at the Dutch consulate in Toulouse. 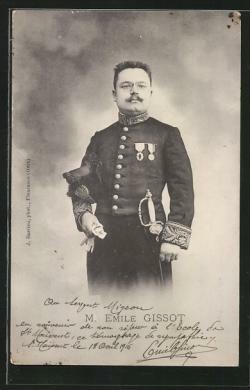 Emile Gissot, a retired French foreign service officer, issued visas as the Portuguese vice consul for Sousa Mendes in Toulouse. Later he took the initiative to establish the Curaçao connection. A.J. Van Dobben and G.P. Pichal, the Dutch honorary consul who was a Philips Company executive and his career officer deputy, authorized tourist visas to scores of refugees in July 1940. Stanislaw Wozniak carried on the functions of the Polish consulate in Toulouse after the premature departure of Consul Stanislaw Dygat, later a prominent cultural figure in Poland. Gissot was an economic policy expert who had served in Santiago, Chile, and Athens, among other postings. The Heinrich Freudmann family obtained the first known Curaçao visa, as documented by the Aristides de Sousa Mendes Foundation. 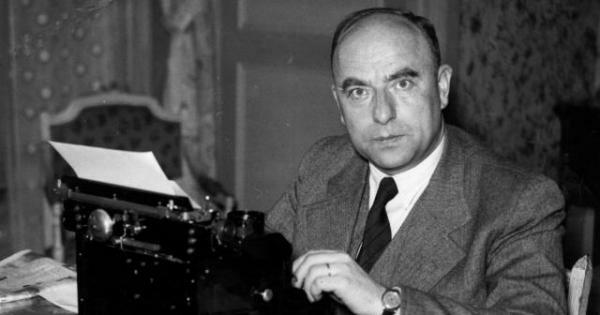 Otto Strasser, the incognito former Nazi leader then on the run from Hitler, was advised by Emile Gissot to obtain a Dutch Curaçao visa. Zbigniew Kowalski, a Polish freedom fighter, used a Curaçao visa to escape to England. Sally Noach of the Dutch resistance Engelandvaarder movement described the role of A.J. Van Dobben in the affair. The Irwin Schiffres family got to Lisbon from Marseilles with a visa for a different Dutch possession. The scoundrel Strasser wrote in his memoir of meeting the "portly Portuguese" Gissot on a bench along the canal. His tip to obtain a Curaçao visa proved to be Strasser's salvation. With Gissot's transit visa in hand, the Ringel party was able to obtain permits to exit France and cross Spain. They laid over for several days in Perpignan, where they collected their forwarded luggage. They entered Spain by rail on July 23, routed through Barcelona and Madrid, and crossed into Portugal at Biera Marvao on July 28. Their exact itinerary from Toulouse to Lisbon is documented by the visa stamps in Elly's Polish passport. The Ringels then spent nine months living in Lisbon, while seeking further visas to North and South America. They never intended to go to Curaçao. 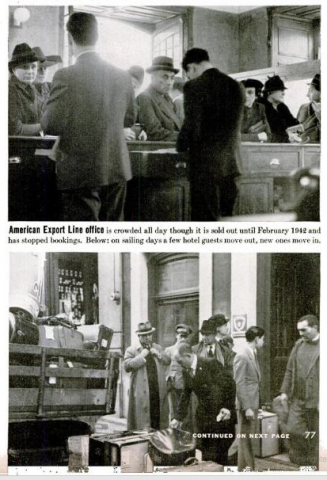 The refugee scene in Lisbon was described in a 1941 Life Magazine photo essay. Another celebrated instance of Dutch Curaçao visas occurred two weeks later on the other side of Europe, in the city of Kovno in German-occupied Lithuania. The Dutch honorary Consul in Kovno, Jan Zwartendijk, a local Philips executive, notated on hundreds of Jewish passports that tourists to Curaçao needed no visa. With that notation, Japanese Consul Chiune Sugihara issued visas for Lithuanian Jews to travel to Shanghai, crossing the Soviet Union by rail. Zwartendijk and Sugihara are recognized as Righteous Among the Nations for their life-saving collaboration. 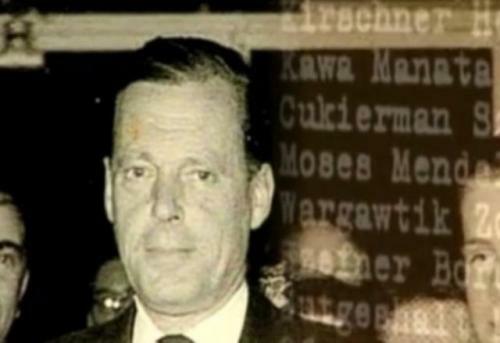 Jan Zwartendijk's revealed his role in the Sugihara Affair to the Dutch government in 1963, but his Philips' employer did not learn of it until 1997. Since Curaçao visas were issued in Toulouse and Kovno within a two-week period in July 1940, both involving honorary Dutch consuls who were local Philips executives, could there have been a connection? Detailed accounts of the Zwartendijk case provide a plausible independent origin for the Curaçao idea in Kovno. Despite the influence of the Philips Company on Dutch government policy, it is most likely the idea arose independently in the two cases. A survey of practices in the Portuguese foreign services reveals a pattern of humanitarian responses to the Jewish refugee crisis, counter to Salazar's government policies. 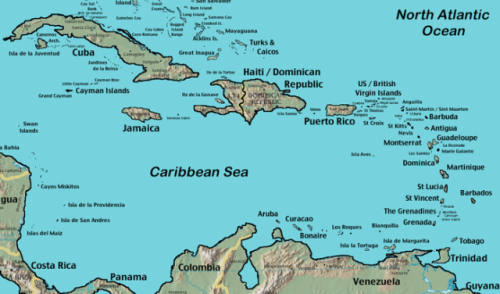 Curaçao was at the center of the strategic Caribbean basin in World War II. The Philips Company relocated its headquarters there before the Nazi takeover of the Netherlands in 1940. The Ringels sailed from Lisbon on April 1, 1941 aboard the SS Guine, bound for a stopover in New York on the way to South America, where they held a residence permit in Ecuador. In New York, Elly and her sister got shore leave while Helga and her uncle were held at Ellis Island. Elly found an unrelated American, Judge William Ringel, to sponsor her entry into the United States. With that assurance, the party was able to leave the U.S. and re-enter in another port. They sailed to Havana, Cuba, and entered the U.S. on May 23 in Miami as legal immigrants. 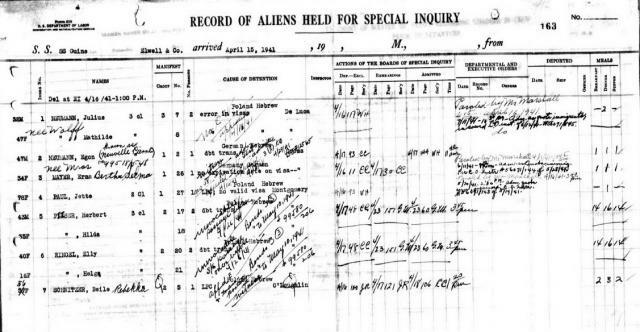 Record of special inquiry shows meals and nights held at Ellis Island for Helga Ringel and Herbert Peiser while Elly Ringel and Hilda Peiser are on shore leave. Although many Curaçao visas were issued, only a few Jewish refugees actually went there. One group arrived on the SS Cabo de Hornos in November 1941 when the Dutch government gave sanctuary to 83 refugees who had been turned away in Brazil and Argentina. At the end of the war, 19 of the Cabo de Hornos passengers were still living on the island. The SS Cuba arrived in Curaçao from Santa Domingo sometime in 1940 with the families Anholt, Mendels and Perlman on board. Suzanne Perlman, originally of Vienna, settled in Curaçao, raised a family and became a successful artist known for her paintings of Curaçao scenes and Jewish subjects. 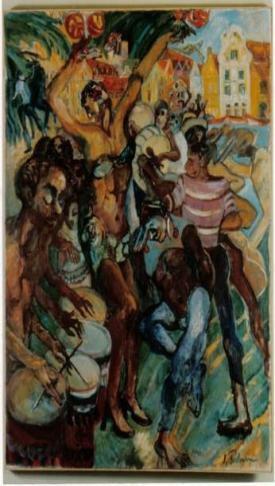 Perlman's work evokes both Yiddish and Caribbean sensibilities. Aristides de Sousa Mendes and Jan Zwartendijk are recognized diplomatic saviors for their independent actions in saving tens of thousands of Jews in the summer of 1940. How, by contrast, should we evaluate the actions of Emile Gissot and the other consuls of Toulouse? It is likely that Gissot (and possibly Van Dobben) accepted bribes from those that they helped. We know that Gissot was later disciplined by the Portuguese government, and that Van Dobben's tenure also ended under a cloud. Wozniak's participation may have been more purely motivated. Dygat's role in the affair is unacknowledged in his biography. More research on each of these points remains to be done. 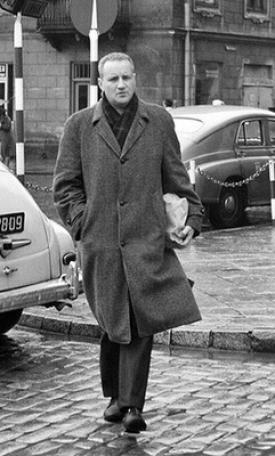 Stanislaw Dygat, pictured in 1962, was a prominent post-war novelist and filmmaker in Poland.